The great city of Novgorod is treasured by its people, as it is considered an important hub for trade and a conduit between the Baltic Sea and Byzantium. Whoever controls Novgorod has control of the trade in the region, which, in these troubled times, means power.Now is the time of the mighty Prince Alexander Nevsky. Alexander led Novgorod to intoxicating victories against the Swedes at the river Neva and against the Teutonic Order at Lake Chudskoe. However, he knows that the Western Tartar army lies to the east and that expanding west may cost them their homelands and possibly the loss of the great city itself.Novgorod will never forget the atrocities the Teutonic Order brought to their homelands, but they present a face of neutrality for the sake of trade in the region. 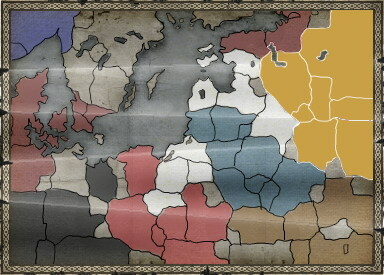 Choosing their enemies carefully and remaining neutral with other nations for as long as possible will be central to ensuring Novgorod maintains its position as the wealthiest city in the region.Novgorod must establish a power base in its mighty capital through trade and strong defences to have a chance of success. Its large populations and loyal, experienced citizen army will ensure a strong local militia to defend its cities. With strong armies of local militia and limitless trade opportunities, Novgorod truly is a “Sleeping Giant” that will have the ability to march on any nation when it chooses to awaken.Although Novgorod has a fierce citizen army, it is their Boyar Sons that are the pride of the nation. Novgorod must use the expendable local militia to ensure the Boyar Sons are not wasted on the front line. These warriors are second to none with a javelin, and with a sword or axe in hand they can match even the best. On the open plains, there is no more devastating a sight than an army of Boyar Sons riding with javelin in hand and all manner of armour and weapons glistening in the sun. Early Novgorodian ship created near the town of Novgorod. Carries soldiers and catapults for raiding land and smashing sea targets.